Your Spirit and God's Spirit! God's Holy Spirit is available to every believer. He comes as Comforter, a Helper, and a Friend, bestowing power for your life. Andrew Murray, a classic Christian writer with knowledge and experience of the Holy Spirit, will show you the power that God wants to give you. This power from God will allow you to revitalize your prayer life and revive your spiritual walk. Among other things, Murray will show you... The purpose of power The essential condition of receiving How to be filled with the Spirit How to worship in the Spirit How to receive power to witness Are you experiencing all that God has to offer? Come into the fullness of a Spirit-filled Christian life today. 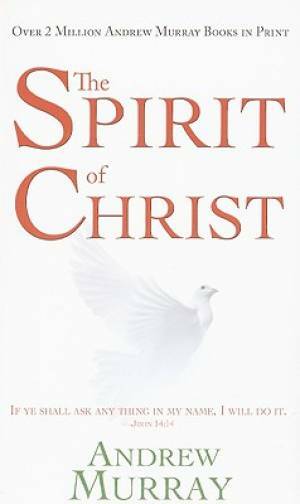 Spirit Of Christ by Andrew Murray was published by Whitaker House in March 2010 and is our 27433rd best seller. The ISBN for Spirit Of Christ is 9780883681268. Be the first to review Spirit Of Christ! Got a question? No problem! Just click here to ask us about Spirit Of Christ.